The colorful bracts of this Midnight Blue Satice (top left) still hold their fresh delicate white flowers. These flowers drop out as their papery holders dry, leaving behind a vividly colored everlasting. American Beauty Rose Statice (top right) has more pink and less blue in the bracts and looks better used with other pinks and blues. If left on the plant too long the flower bracts start to turn purple, so harvest when rosy pink for best color when dried. In the planter on the right you can see how big the plants get in one season. This is four three-inch pots planted in early summer. This rapid growth allows Statice to be grown as an annual in Zones 2 through 7. You can also see the difference in color between the Rose on the left and the Blue on the right. In case you are wondering the green mound on the ground is a nutmeg geranium. It is drought resistant, heat tolerant and, maybe best of all, unattractive to gophers! 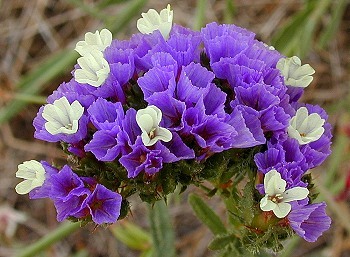 Once Statice starts blooming (usually mid to late Spring) it continues to bloom until frost. It can be harvested from many times during the season. Each time cut the flower stalks back to the ground or to the leaves at the base of the plant. Statice (the brightly colored flowers in the wreath at right) provides just the right punch to brighten up any wreath or floral arrangement. The color of the dried bracts, kept out of direct sunlight, remains vibrant for a year or more. Only the eventual problem of dust makes the bouquet or wreath obsolete. 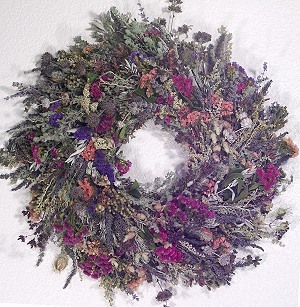 For more information on how to use fresh flowers from your garden to create dried arrangements, visit our Wreath Making Workshop online. These plants are sometimes available in plug trays. These trays hold 128 of all the same plant. They are a great low cost way to fill a lot of space. Each cell is 3/4 of inch by an inch. Check here to see if Statice Plug Trays are available. 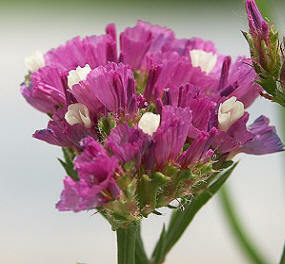 Statice is one of six plants chosen for our Crafter's Herb Garden Six Pack. 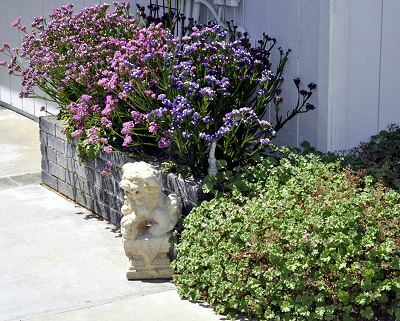 It would also make a great addition (for Zones 8 and up) to our English Cottage Herb Garden Six Pack.